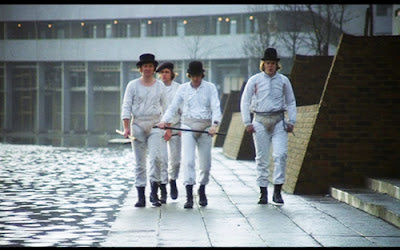 A Clockwork Orange (1971); directed by Stanley Kubrick; produced by Stanley Kubrick; adapted by Stanley Kubrick from the novel by Anthony Burgess; Cinematography: John Alcott; Editing: Bill Butler; Score adapted by Walter Carlos; distributed by Warner Bros; Awards: Academy Award nominations for Best Picture, Best Director, Best Adapted Screenplay; Best Editing; for a full list of awards and nominations, go here. Stanley Kubrick’s 9th full-length film is the first of his I remember hearing about—before I ever saw it, it had baggage. When it was originally released it was given a “X” rating by the relatively new MPAA rating system, and when my parents saw it in the summer of 1972, it so happened that my father’s Cadillac was stolen that very night. It has always been hard for me to imagine my mother sitting through this film, in a cinema no less, with my father—after all, the National Catholic Office for Motion Pictures had condemned the film, which meant the Church forbade good Catholics to see it. I’m sure my dad got a good earful on the ride home, even if it were only an earful of silence. My mother used to attribute a certain grim causality to the theft and her viewing of “that terrible movie”—no doubt the only X-rated film she ever saw. When I first saw the film it was the fall of 1976 and I was a senior in high school; my older brother had touted the film for some time as a must-see, and by then I’d seen Barry Lyndon (1975) and the re-released 2001: A Space Odyssey (1968) and was convinced that I should see everything Kubrick made after the latter, which I regarded as the movie equivalent of The Beatles’ “breakthrough” with Revolver, or Dylan’s “breakthrough” with Bringing It All Back Home. In other words, it was as if, before 1965, the world was only black-and-white; after that, it was Technicolor. 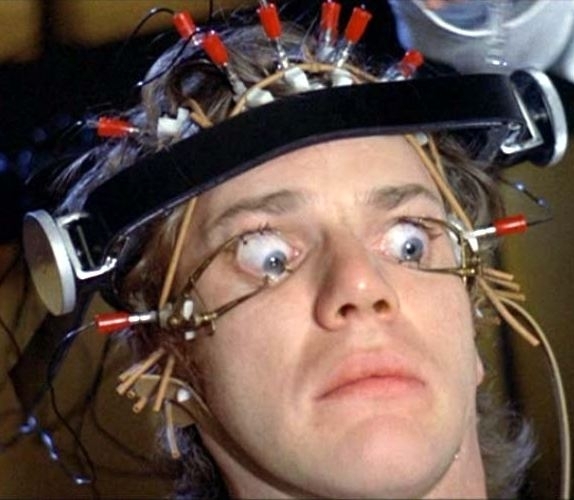 A Clockwork Orange did not disappoint—or, maybe it disappointed a little. Certainly it took awhile to become one of my favorite films, and it still seems an odd movie to feel affection for. And that’s because of the baggage I’m talking about: the film arrived for me as a film that takes a sardonic, darkly comic view of the efforts by the State to rectify human nature. 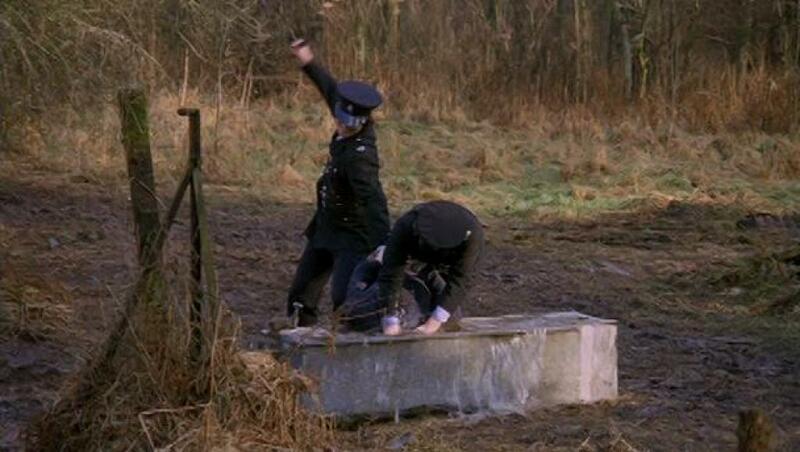 But it doesn’t launch that view in the name of a romantic assessment of the worthiness of the individual against the State, or of any kind of “be yourself” glorification popular in the hippy-inspired films of the late Sixties. 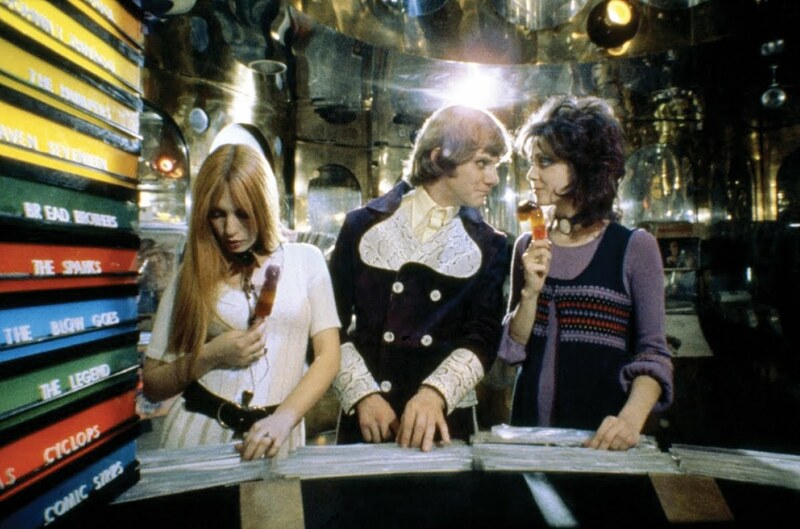 In keeping with the early Seventies’ formidable line of filmic anti-heroes, Kubrick gives us the irresistibly charming Malcolm McDowell as Anthony Burgess’ Alex, and in the process makes Alex his and McDowell’s. They own the property after this. Alex, in this film, is no misunderstood James Dean, no moody Brando, no rebel without a cause or hoodlum with a soul—he’s mischievous, smug, verbal, charming, and as preening as Mick Jagger. With his wide-eyed baby blues, McDowell establishes the anti-hero as a man-child whose only hope, when pitted against the modern world, is a dance between brash, balls-out disdain for anyone who would curb his spirit and woe-is-me pleas that might earn a stay of execution. Our access to Alex is artfully aided by his voice-over, an element of the film that goes a long way to create sympathy for Alex, and that’s necessary because unlike other JDs with star power, Alex has no girl—or even deeply attached buddy or brother—to love him. He speaks to us as his “brothers”—and that appeal is important to the solitary travails of Alex. True, Alex has no redeeming social value—as the Minister of the Interior (Anthony Sharp) says upon meeting him in a prison line-up, he’s “enterprising, aggressive, outgoing, young, bold, vicious.” The State’s experiment in turning such a self-powered coxcomb into a whimpering mama’s boy is manifestly evil—for some a necessary evil for the sake of Law and Order—but the film is content to laugh at both those who champion the integrity of choice—like the Prison Chaplain (Godfrey Quigley)—and those, like the Minister and the scientists eager to test their method, all-too-ready to perform improvements upon those deemed unfit for civil society. One of the ironies of the film, during the second half when everyone who Alex brutalized (except the woman he killed, of course) gets the chance to avenge themselves, is that one of his former victims would be one of his supporters—for political reasons—were it not that he and his wife were Alex’s victims. It’s a not very subtle rendering of the idea that all the bleeding heart liberals would unleash the State’s attack dogs if they had suffered at the hands of the criminals they prefer to see as unfortunates. Yet it is true that Alex is a victim—a victim of his own bad choices, certainly, but also a victim of his “droogies” and of the State. The “cure” for hooliganism is not lobotomy—the film seems pretty certain about that, so that a “cure” for “the cure” becomes the reinstating of the sociopath’s original instinctive “me against them” urge to thrive at the expense of others. I think what put me off in my earliest viewing of the film was the fact that this lockstep return of Alex to all the same situations he’d already experienced—“good” this time instead of “bad”—wasn’t very imaginative or interesting. The unpredictability of the bad Alex gives the first half of the film its thrills and it’s the interactions between these scenes of “ultra violence” and Kubrick’s methods of relaying them that create the tensions that make the film so successful. 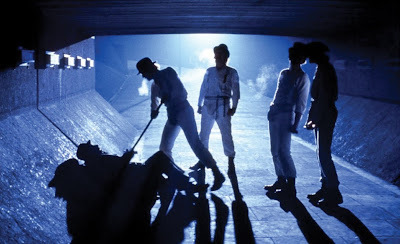 The sport Kubrick has with the viewer and the material is palpable, and the aesthetic effects are incisive for a rather low-budget film (after such Kubrick epics as Spartacus and 2001)—indeed, the low-budget aspects of the film help to give it the “glam-punk” edge that forever associates it with the early Seventies and the distancing from the style of the late Sixties. The Sixties are there, doctored, in details like Alex’s Carnaby Street get-up when he visits the discoteque—back when a discoteque was a place to buy and hear discs—and in the New Brutalism of the architecture Kubrick chose as backdrops. During Alex’s incarceration, the effort to find fun with the material stretches a bit thin at times—as with criminals making rude sounds during the Chaplain’s hell-fire sermon—and much of the interest is provided by Michael Bates as Chief Guard Barnes, in a performance rich with insight into the humanity of the authoritarians on the front lines, as it were. Orange has a great visual style, of course, the main reason it’s on this list, and, as with Barry Lyndon and 2001, a sense of the interplay of music and image that is second to none (Walter Carlos’s synthesized treatments of Beethoven are aural emblems of what the film aims for), but it should also be said that this is Kubrick’s best film for exploring a central character and one of his best in terms of little touches in the acting (Alex being served wine by the writer (Patrick Magee), a comical case in point). Coming before Barry Lyndon, Orange also shows Kubrick’s transition to being a British film-maker, as the tone and mood of the film is more closely aligned with British films of the Sixties than to anything from the U.S.—one could even say the film is in the line of films, by the likes of Lindsay Anderson and Karel Reisz, that were the cinematic equivalent to “angry young man” theater. In fact, Kubrick withdrew the film from screenings in the U.K. after an outcry that the film inspired “copycat crimes.” Its feel for what Morrissey calls “tender young hooligans” is prescient, maybe even prescriptive. The touch of having Alex sing “Singing in the Rain” while brutalizing the writer and his wife (Adrienne Corri)—attributed to Malcolm McDowell’s ad lib—is one of those instances where a great film moment—Gene Kelly’s dance in a downpour as an expression of irrepressible high spirits—gets completely twisted and perverted in a subsequent one. More than anything, that scene reveals the heart of the film: the song is beyond good or evil, it can accompany either act. It’s a stunning instance of art and artfulness—the pleasure we take in performance—turned against the viewer. We don’t want to watch, maybe, but it’s fun to watch. The use of Alex’s unthinking singing of the song in the bath, on his second visit to the writer’s home, after the Lodovico Treatment, allows it to trigger our memory and the writer’s, and to establish Alex as the same spontaneous person, whether bad or good. Then to conclude the film with Gene Kelly’s version over the credits: it’s as if the narrative itself (or its author, Kubrick) is evoking a carefree response to all the bad done to feel good and all the bad done in the name of good. The film’s “good,” ultimately, is that of art—the skill to render the pitfalls of our society in a memorable film, that, of course, is implicated by the fact that its skill gives us pleasure. 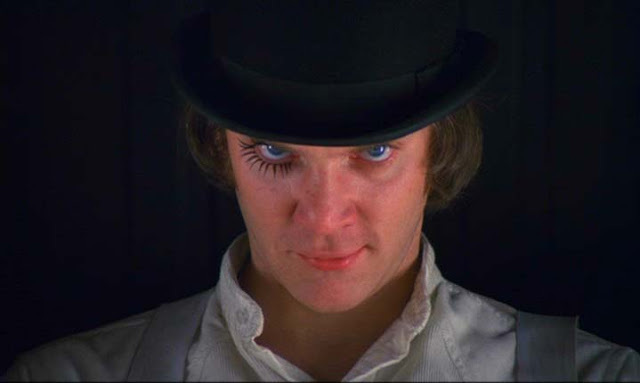 It is not a revolting film (Kubrick doesn’t want to strap us to the chair like Alex, forcing us to viddy what will harm us), but is a challenging one, still. If it only becomes “fun,” well, that’s not good. Labels: 1970s, 50 Films Since 1970, analysis, favorite movies, film-viewing, list, movies, Stanley Kubrick, Whatcha Watchin?